Oh, who am I kidding...I love Paris any time of the year (except for the hot, touristy months of July and August). Less than a month and I'll be in France. Yippee!!! 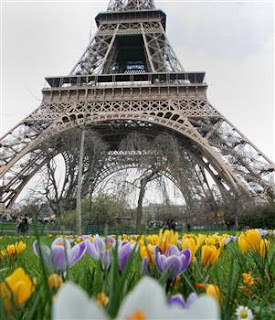 The crocus flowers are blooming now as the weather is warmer in Paris sooner than usual. One week 'til Washington D.C. Thanks again, Mr. Pyrex Loaf Pan!!! Pasta + Candy Bar Pie = Oh, my tummy aches!!! That's a Peach (Muffin), Dear!!! Thanks for dinner, Roberto Luongo!! !